Experts in apostilles, police clearances and South African documentation. Apostille and documentation solutions for South Africa. An unabridged birth certificate with the DHA stamp. You have found your dream job abroad, or perhaps, you are considering the idea of heading overseas to go and find that dream job. Either way, you will have to apply for visas, regardless of where in the world you are traveling to. On this page we will take a look at what your options are for applying for visas, discussing your options for DHA applications and how we can assist in lodging and fetching them with or for you. Applications for civic certificates, like birth certificates, death certificates, late registrations of birth, marriage certificates, letters of no impediment, etc. are done at a Department of Home Affairs office or overseas mission, however the timing of the documents is very lengthy and we are able to assist you faster and apostille/legalise and courier your document/s to you, even overseas. Click here for our pricing on this service. VFS Global manages Visa Facilitation Centers for the Department of Home Affairs in South Africa, where you will need to submit your application forms, supporting documents, and biometric data. VFS Global processes temporary residence visas, permanent residence permits, waivers, exemptions, proof and verification of permanent residence permits, and proof and verification of exemptions. VFS operates in line with the regulation 9(1) of the Immigration Regulations, which states that visas to temporarily sojourn in the Republic in terms of section 11 up to and including sections 20 and 22 of the Immigration Act, 2002 (Act No 13 of 2002), as amended shall be submitted with all supporting documents. Although VFS Global is the managing authority that accepts applications for visas and permits, they do not make decisions pertaining to the outcome of your application. 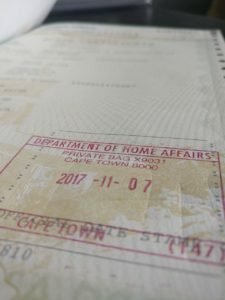 The final decision of whether or not you are granted a visa or a permit rests in the hands of the Department deof Home Affairs’ Head Office, in Pretoria. All applicants submitting a visa or permit application must attend the Visa Facilitation Centre in person. You should make your application 60 calendar days before the expiry date of your valid passport and visa or permit. Which documents must be submitted for visa applications? Below is merely a standard set of documents as per the VFS website. 2. On the day of your appointment, you have to be at the Visa Facilitation Centre 15 minutes ahead of time. Make sure you take your appointment letter, the printed online application form, proof of payment, and all supporting documents (which you can learn more about here) along with your valid passport. When you arrive at the Centre, you will be given a token and will have to wait for your number to be called to make your application. After the application process has been completed, you will be issued with an acknowledgment receipt, which will be used to collect your visas or permits once they have been issued. 3. You will have to enrol your fingerprints and photograph at the Visa Facilitation Center, which is referred to as your biometric information. After the application has been made, it can take up to ten weeks for a decision to be made, but the turnaround time is often shorter. 4. You can choose whether you’d like to collect your documents in person at the Visa Facilitation Center or have a representative collect the decision for you. You will need your original passport to collect the decision or have an authorized collector collect the decision on your behalf with proof of authorization to collect documents on your behalf. apostil.co.za does not prepare or handle full visa applications or advise which documents must be included for the numerous visa options that exist. We only assist in the lodging of the application and receipt of the outcome at VFS, in some cases together with the applicant, who must appear in person. For full visa application support, look online for the various South African immigration agencies. What we can definitely do is help you apply for civic certificates and documents such as birth certificates, death certificates, late registrations of birth, marriage certificates, letters of no impediment and more. See our pricing. Apostil.co.za is a documentation service for apostilles, notarisations, authentications and various certifications of documents in South Africa. Apostille and legal documentation services to individuals and corporates for South Africa. We represent a privately owned apostille and documentation services firm. We are not a government department or High Court issuing body. We charge for speedily and successfully obtaining various documents/legalisations. Using this website and our services means that you accept our Terms and Conditions.